The Chromecast Ultra allows you to stream up to 4K Ultra HD and HDR picture quality over your WiFi network. It plugs into your TV’s HDMI port, providing fast and reliable streaming with minimal buffering to enhance your home entertainment options. 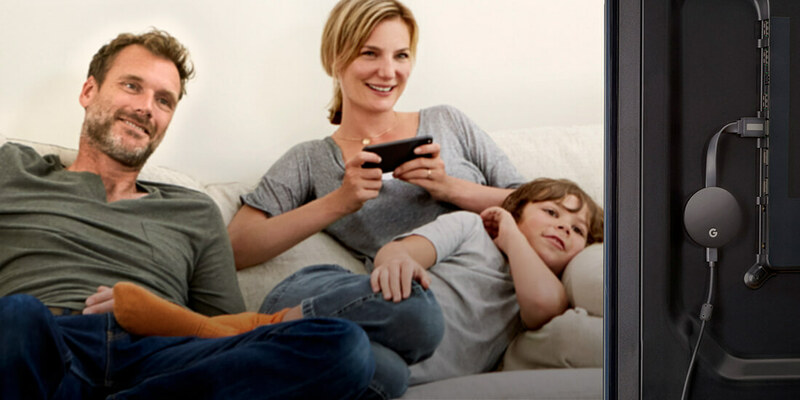 While you’re streaming you can also multitask – take calls or send messages without interrupting what’s playing. 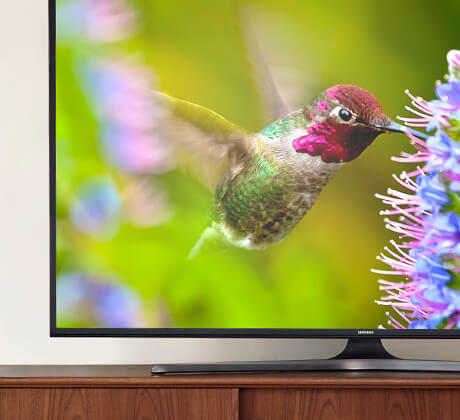 Enjoy a crisper picture, deeper colour and smoother videos when you’re streaming Ultra HD 4K content to your 4K TV thanks to the Chromecast Ultra. 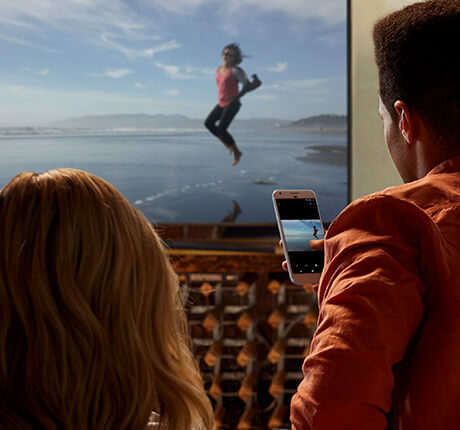 Whether you’ve got a 4K TV or a Full HD TV, the Chromecast Ultra automatically optimises the content so you can enjoy the best possible picture quality. The Chromecast Ultra provides quick and reliable performance, with minimal buffering and smooth streaming. With robust processing power, you’ll be able to get your shows playing faster and more reliably with smoother video. 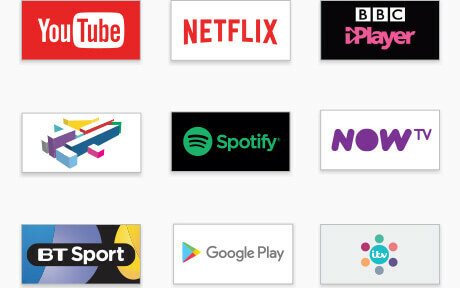 If you’re in a tricky WiFi environment, the Chromecast Ultra comes with a built-in Ethernet adapter, so you’ll be able to enjoy stable streaming where you’ve got a wired connection. All of this is packed into a compact design that fits behind your TV so it won’t clutter your entertainment centre. 1. Plug Chromecast Ultra into the power source and your TV’s HDMI port, and then select the HDMI input on your TV. 2. Download the Google Cast app and follow the instructions. 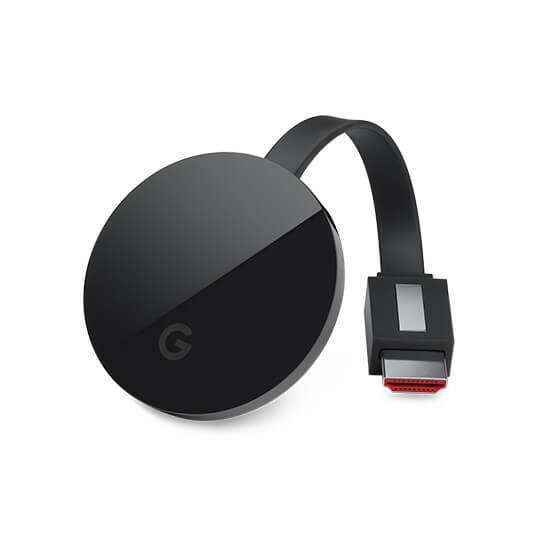 Delivers everything that you love about Chromecast Ultra, plus faster processing speeds and up to 4K Ultra HD & HDR picture quality1. Chromecast Ultra works with iPhone®, iPad®, Android devices, Mac®, Windows® and Chromebook. 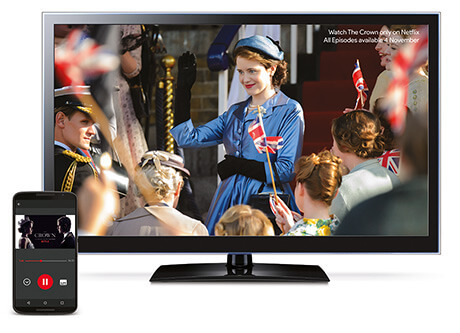 Simply use your mobile device to stream your favourite TV shows, movies and more to the TV. And while streaming, you can still text or call without interrupting what’s playing or draining your battery. 4K Ultra HD & HDR1 enables crisper picture and deeper colours. Even without a 4K TV, Chromecast Ultra delivers the best picture quality possible for your TV. Connect your phone, tablet or laptop to the same Wi-Fi network as your TV.